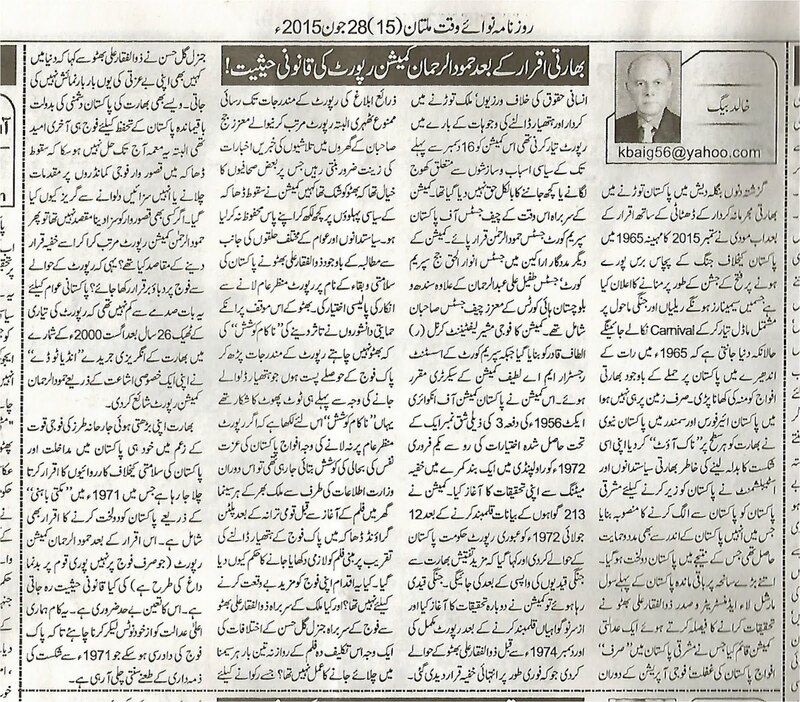 Truth by Kbaig: Legal Value of Hamood-ur-Rehman Commission after Indian Confessions..! Legal Value of Hamood-ur-Rehman Commission after Indian Confessions..! 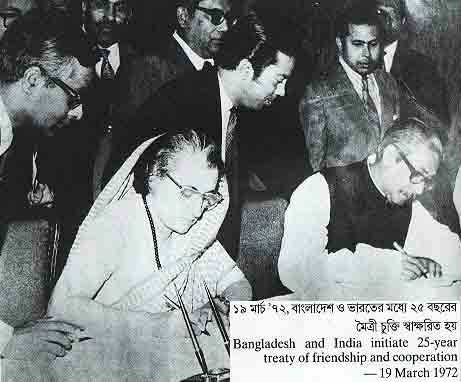 After confession of Modi at Bangladesh for having played active role in separation of Bangladesh, Modi has announced to celebrate the victory in 1965 war after 50 years of the Indian aggression. In these celebrations different seminars would be held as well as carnivals based upon the war like environment would be presented as well. Everyone knows that Indian army in the dark of the night attacked Pakistan on 6th September 1965 but India had to lick the dust due to the bravery of our soldiers, not only in the ground battle but in the air and sea as well. Indian army was knocked out by brave Pakistani soldiers despite of having much supremacy in number and weapons. In order to take revenge of this defeat Indian establishment and politicians prepared a plan to disintegrate Pakistan through the help of traitors in Pakistan. 16th December 1971, was the darkest day of the Pakistani history when Eastern Command of Pakistan army had to lay down the weapons due to conspiracies especially political treason. This is such a defeat that needs to be balanced in the war otherwise Pak-Army will remain target of a special category in our society; criticism of Pak-Army from within Pakistan is also required by India as well as a psychological weapon. Although in 1971 war Indian was victorious due to her conspiracies but not due to the professionalism of her army but India failed to fulfill her dream of Greater India (AKHAND BHARAT). 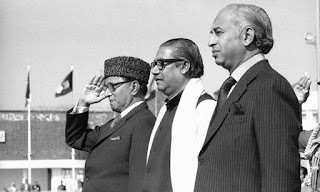 The only Pakistani Civil Martial Law Administrator, Zulifqar Ali Bhutto, established a Judicial Commission to look into the causes of defeat of Pakistan in 1971 war but the Commission was not allowed to go beyond the military defeat i.e. the political scenario and treason that led to the fall of Dhaka. The Commission was responsible to investigate the reality of allegations over Pak army for committing atrocities against Bengalis and find the reason of military surrender. Justice Hamood-ur-Rehman, Chief Justice of Pakistan was appointed as head of the Commission while Justice Anwar-ul-Haq, Justice Tufail Ali Abdul Rehman and 2 Chief Justices from Sindh and Balochistan were appointed as members of the Commission; Lt. Col (R) Altaf Qadir was appointed as Military Advisor while M.A. Latif was the Registrar of the said Commission. The Commission started enquiry in a secret meeting held at Rawalpindi on 1st February 1972 under the Section 3(1) of Pakistan Commission of Enquiry Act 1956. Commission presented interim report n 12 July 1972 after recording statements of 213 witnesses; complete report was presented after recording the statements of Prisoners of War before December 1972. Bhutto declared the report to be TOP SECRET and denied access of media to the report. However, the reports of searches in the houses of Respected Judges were reported by newspapers. According to some journalists Bhutto had suspicions that Judges might have procured some information about political reasons behind fall of Dhaka and hiding the evidence in their houses. 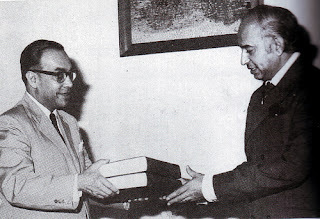 Despite the demand of public and politicians, Bhutto denied disclosing the report of the Commission; supporters of Bhutto made a failed attempt to explain the reason behind secrecy by Bhutto that if the details of the report are disclosed this would de-morale Pak-Army and nation would start hating army. If this explanation by Bhutto supporters is accepted to be true and Bhutto was so much interested in saving the face of the army than why Ministry of Information ordered all the Cinemas to show the clip in which Pak-Army was surrendering before Indian army before every Movie Session? Was not this an attempt to de-morale and insult Pak-Army? Was not the display of this clip three times a day in Cinemas a reason behind dispute between Bhutto and General Gul Hassan as Gen Gul Hassan that no nation in the world repeats and shows the clips of its defeat in such a way? 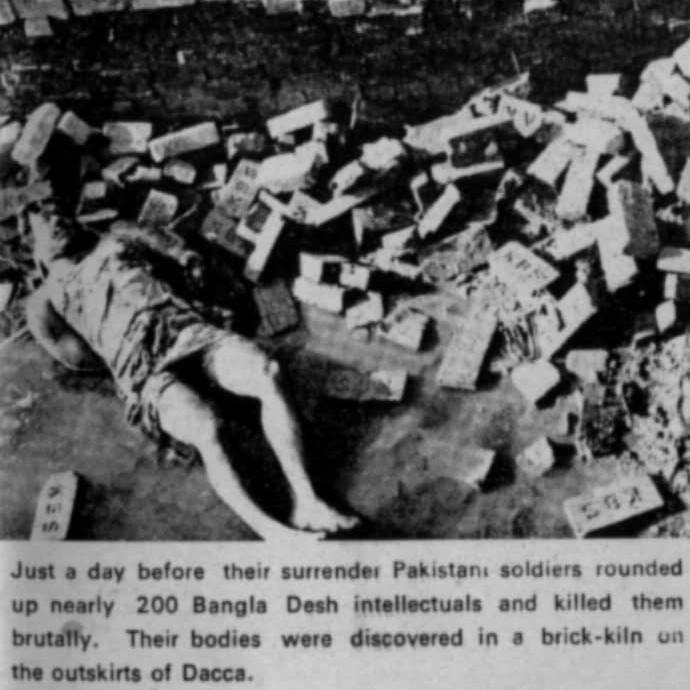 Despite of the failure in 1971 war, was/is not the Pak-Army the only institution responsible for defense of the motherland? However, this mystery has not been solved until now that why did not Bhutto trialed and punished those Military Commanders who were declared guilty by the Commission? If the purpose of the establishing of Judicial Commission was not to punish the guilty than was it only to pressurize and black mail Pak-army so that army does not dare to disclose the heinous role of politicians behind fall of Dhaka? This report was not less than a shock for Pakistanis that exact 26 years after preparation of the report, India Today published the Hamood-ur-Rehman Commission report in its August 2000 edition. In spite of started enquiry that how a TOP SECRET report fell in the hands of an enemy newspapers (right hand of Indian RAW), a propaganda wave based upon the excerpts from Indian version of report was launched against Pak-Army by Pakistani media. Pakistani politicians also played their dirty role in this propaganda perhaps due to General Pervaiz Musharraf who was in power at that time. Like ever, Pakistani media and politicians tried to defame Pak-Army in such a time when it was fighting difficult war against Indian terrorists. Now all the conspiracies of the enemy are being disclosed one by one. India due to the surety that Pakistani media and politicians will never raise their voice against Indian aggressions and conspiracies is confessing her conspiracies against Pakistan and now she had confessed that who were Mukti Bahni and how they were prepared by India. This confession has not come from some retired army officer or politician but Indian Prime Minister Modi. After such a big confession from Modi what is the value of Hamood-ur-Rehman report; the validity of the report should be decided by Higher Judiciary of Pakistan so that the allegations against Pak-Army are removed and Pak-Army is not victimized by our traitor media anymore for fall of Dhaka.